Anytime a manufacturer describes a sleeping pad as providing “ultimate comfort” yet still classifying it as superlight the red flags go up. This time though the Big Agnes Double Z sleeping pad actually comes pretty close to living up to the hype. It is classified as a warm weather sleeping pad that provides its comfort though a 4 inch think air chamber while still coming in with a claimed weight of 16 oz. Its also a 1/2 mummy – the top is square while the bottom retains the classic mummy shape to reduce weight. I really appreciate this since I like to sleep on my stomach with my arms going all over the place. Normally my arms end up falling off the sides of the sleeping pad but not on the Double Z. All these things make the Big Agnes Double Z one of the most comfortable sleeping pads I’ve used. Other features of this pad include Big Agnes’s new two way inflate/deflate valve (which works great inflating by keeping air from escaping between breaths and also deflates the pad faster than the traditional Big Agnes valve) and raised sides to keep you from rolling off during the night. I’m also a big fan of how the air chambers within these pads are constructed. By not using the traditional horizontal or vertical air tubes the air is distributed far better resulting in a much flatter feel with less bouncing. Its also a really cool color blue. Blue is calming right? Maybe it helps you relax and fall asleep faster. 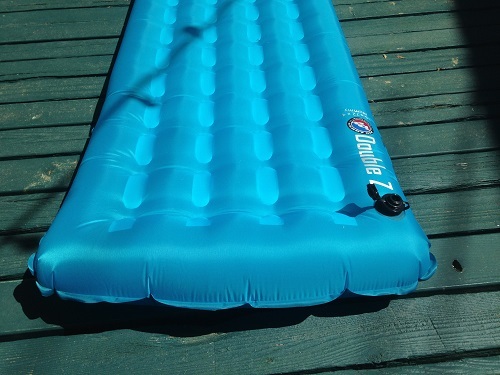 When it comes down to it though this is a great summertime sleeping pad for anyone who has a hard time getting comfortable in the backcountry. The valve is opened for inflation right now. If you unscrew the lower bottom ring you will expose a much larger opening for deflating the Big Agnes Double Z sleeping pad. Unfortunately there are some things about this pad that I don’t like. One of my primary gripes is that the new valve, while working really well, is no longer compatible with the Big Agnes Pumphouse Pad Pump Dry Sack. While it wasn’t quite as easy to use as the Exped version (the Schnozzel Pumpbag) it still worked really well and let you inflate your pad quickly and easily without getting lightheaded. Hopefully Big Agnes comes out with an updated version of their Pumphouse Pad Pump Dry Sack sometime soon. Another complaint I have, and also have with the other Big Agnes pad I recently reviewed (the Big Agnes Q-Core SL sleeping pad), is the weight. The advertised weight of 16 oz. (I picked up the 20 inch by 4 inch by 72 inch version) isn’t what I would consider “ultralight” but if it means I will sleep soundly through the night and not feel any rocks that might be beneath me then that is one of the few weight sacrifices I’m willing to make. The bad thing though is that when I weigh this pad it comes in at 18.4 oz. That’s 12.5% more than advertised and I didn’t even include the stuff sack. Even with it being overweight, if 18 oz. really guaranteed that I would sleep better I would pack it with me but the Big Agnes Q-Core SL weighs 1 oz. less and is just as comfortable in my opinion with a thickness of 3.5 inches. The Q-Core SL also has an r-value of 4.5 (vs. the 1.5 of the Double Z). I was also disappointed with the raised sides and their ability to keep you from rolling off as easily. While I could see the difference when comparing the Double Z against the Q-Core SL I didn’t notice any discernable difference with it came to how easy it is to roll off. It could be that this subtle difference isn’t super noticeable but makes an impact when you are sleeping. As you can see in this picture the two sides are slightly higher than the center. The end of the Big Agnes Double Z sleeping pad is also slightly higher to act as a headrest. These features, while nice, need to be more pronounced to make a noticeable difference. The final complaint I have is that the fabric is a tad slippery. I wish they had made it with something that had a bit more grip. When I use this pad (and most others for that matter so this is more of a industry wide complaint) I tend to slide off the end during the night. I’ve solved this problem myself by taking some Gear Aid Seam Grip (intended to seal the seams of tents) and dabbing a little bit of it every few inches on each side to create some rubberized traction. This keeps both the pad from moving around during the night (I seem to gravitate toward tent walls for some reason) as well as my sleeping bag from sliding off one end or the other while I sleep. Even though this pad weighs more than advertised (and more than I would like to carry) it’s still not so heavy that I wouldn’t recommend it in the right situation. If you are someone who has trouble sleeping in the backcountry and has tried other sleeping pads without finding one that works give the Big Agnes Double Z a try. It does deliver on its claim to be one of the most comfortable sleeping pads around. This entry was posted in Activities, Activities, Backpacking, Brands, Big Agnes, Brands, Gear, Product Review, Gear, Sleeping Pads. Benjamin, thanks for the review of the Double Z pad. I’m familiar with the Big Agnes Pumphouse and also the Exped Schnozzel. I’ve had both brands of pads and have also had both pump bags. I agree the Exped Schnozzel is really a better pump bag. Is there any chance the Exped Schnozzel could be modified to fit the Double Z valve for inflation? My wife is really wanting the Double Z pad but neither of us want to huff and puff to blow that bad boy up each time. Thanks again for your help. That would be a pretty difficult mod. I would think it would be easier to rig something up from scratch. 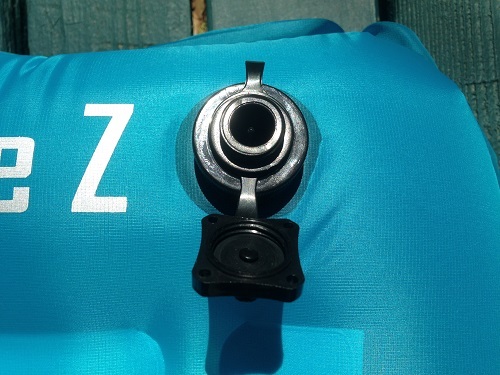 Using a 20L or 35L Sea-to-Summit Ultra-Sil Dry Sack as the main air chamber of the pump bag and then in the bottom make a hole and sew the same style opening as the Big Agnes Pumphouse but with a large enough mouth to fit over the entire valve used on the Double Z. It would also probably be a good idea to seam seal the new seams you have created to help keep air from leaking out when you try and inflate your sleeping pad. While this would require a bit of sewing to pull off I can’t imagine it would be super difficult.